It’s September already and Helena is on the way to South-Africa. A lot has happened since we last posted here, not surprising since that was in December of last year! 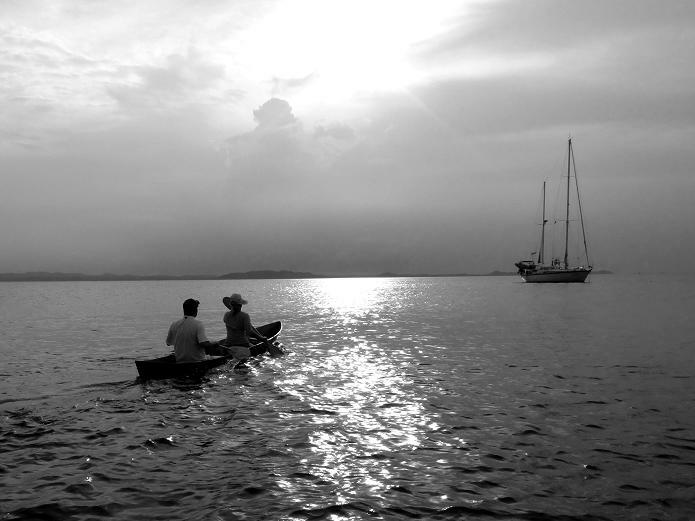 In short: we sailed around SE Asia, had a lot of engine trouble and went back home for a couple of months. And oh yeah, Boukje decided she was done with long passages, so Rolf is crossing the Indian Ocean with crew. On the 31st of October Arent turned 40-ish. That means birthday songs, a homemade cake, best wishes and, if at all possible, a huge party. 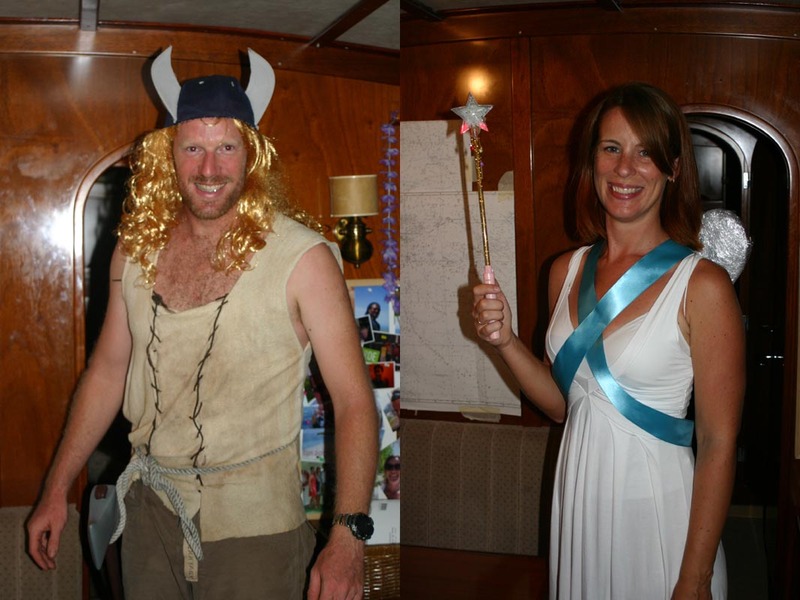 As he (and we) don’t know that many people in this part of the world yet, we decided to take him to the party of the year on Tahaa: Halloween at the Taravana Yacht Club. We did it! Last Thursday we received the watermaker and installed it ourselves. This involved Rolf sitting in the engine room for 8 hours, Boukje handing screws, tools and drinks and the two of us using a hammer 🙂 to change some of the parts. But as I said: we did it, and it works perfectly! Now we can make 60 to 75 liters of drinking water an hour. It’s amazing. The same day we were busy fixing the watermaker, Arent and Matty and their captain Mike arrived back in Raiatea (still waiting on repairs). And because the wind was now coming from the north (just where we want to go), we had plenty of time on our hands. So we enjoyed some nice days catching up and being tourists on Raiatea with them. We did indeed leave Tahiti the next day. Happy to finally be sailing again, we set course for a relaxed trip to Moorea. Moorea is a nice small island that lies about 20 miles west of Tahiti. We had been seeing it’s mountains in the distance for the last month. 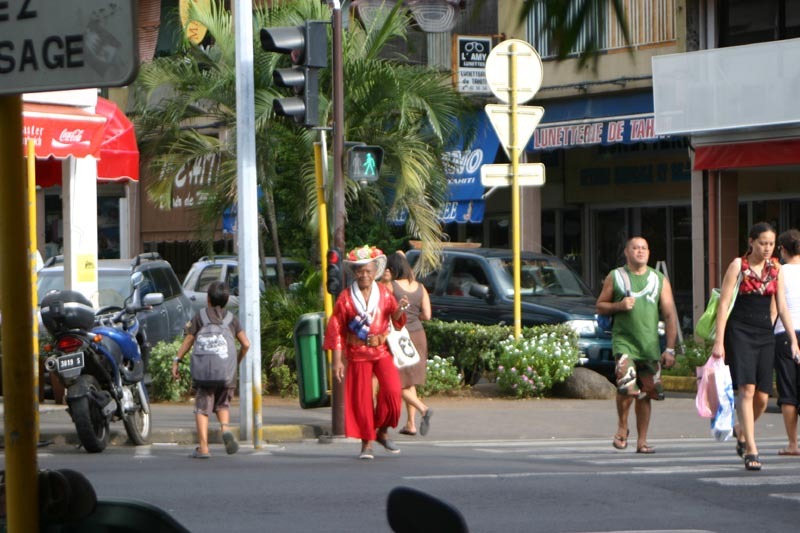 Now that we got there, it turned out to be as nice and peaceful as it had looked from busy Papeete. We anchored in quiet Cook’s Bay, went for a dinghy snorkeling trip around the north coast and hiked our way up the mountains towards a beautiful view of the coast. This last month in Tahiti we’ve made use of all the time we had to wait for parts to arrive, by improving the boat and playing tourists. As we’ve not been keeping up the blog (sorry), here’s a short impression of our activities in the last month. Tomorrow morning we’re making an unscheduled stop at Manihi, because we have taken damage on the steering system. The hydraulic autopilot (which was replacing the original autopilot that broke down on the way to the Marquesas) has broken the steering system. So now we have a jury-rigged autopilot with the emergency tiller on the stern deck. Steering the ship manually is now an old fashioned undertaking while sitting at an actual helm and the autopilot needs re-attachment with improvised ropes. No worries, we’re under complete control. Since we’re arriving on an atoll tomorrow morning this shouldn’t give too many problems. It’s going to be a logistical challenge now though, because we’re supposed to pick up Boukje in Tahiti and we’re in need of a welding shop… I guess we’ll have to figure that out when we arrive. Helena in the Miraflores Locks in the Panama Canal as seen on the live webcam of the Autoridad del Canal de Panama. St Kitts is behind us now and we’ve set sail to Guadeloupe where there is an Amel yard. Since Helena is an Amel, we figured that it would be a nice place to do some large maintenance and many upgrades. Everything was nicely arranged in advance only to find out that Amel did not remember to order or prepare anything in advance, even though everything was arranged and agreed on by email in advance. 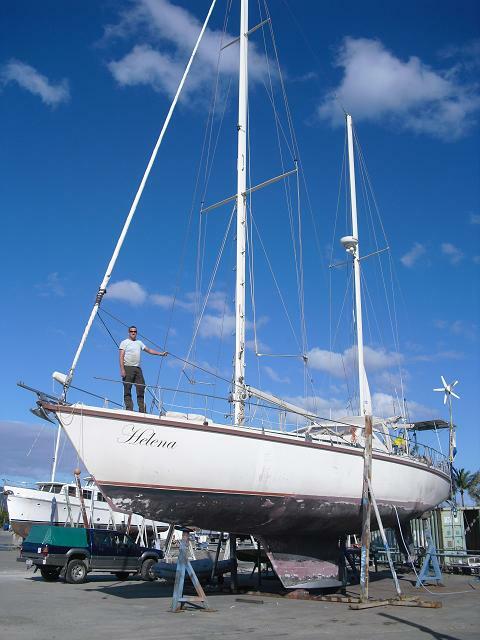 These are the voyages of the sailing yacht Helena. Her mission: to explore strange new worlds, to seek out new life forms and new civilizations, to boldly go where no one has gone before.